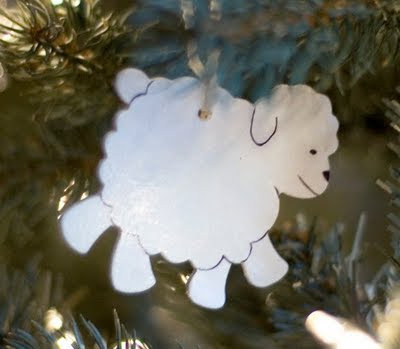 I shared before about the special way we decorate our Christmas tree and the challenge of finding appropriate ornaments. 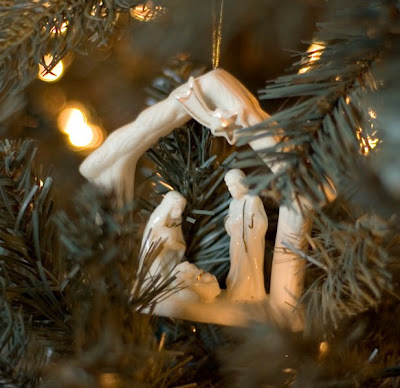 I posted photos I took last year of some of our ornaments. Most of those were made about 7 years ago, and some of them were falling apart last year. We decided to retire the ones that glue could no longer repair, and I made a plan to add more to our collection by this Christmas. I had the best of intentions, but I did end up putting that off until crunch time (about the time we pulled down the tree to begin putting it up). I always have my eyes peeled for items that might make fitting ornaments, but it's still difficult to find enough to fill a semi-fat tree like ours. Probably the easiest ones to find are those that actually portray the nativity or elements of the nativity. Once people find out about our tree and our hopes for it, they often pick up nativity ornaments for us as they come across them. This is just one such gift we have received, and It's always fun to remember who gave us each one as we place them on the tree every year. 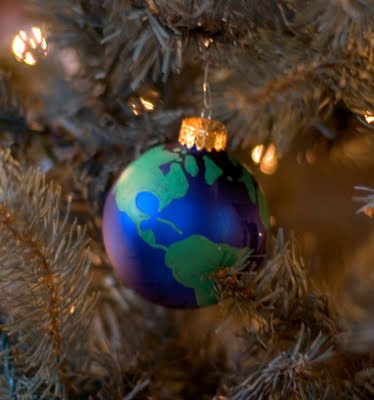 One of the main things I wanted to accomplish for this year's tree was to replace the earth ornaments. When I made the first ones I used styrofoam balls coated with a special product to create a solid surface. Then I painted them blue and later added the green land in with a paintbrush. I didn't have little people running around at that time, and I needed a better plan for the new ones. Besides, the materials weren't holding up, and I hoped to come up with a more durable solution. I ended up purchasing some plain blue glass balls after Christmas last year. Then I just used a green paint marker to draw the land onto the balls. It was a little tricky because I had to let one side dry before doing the other side--and keep them away from little hands. I'm pleased with how these turned out. I'll caution you not to look too closely at the land masses, and I really hope no one in East Asia is offended, but I always seemed to run out of space. If these fall apart or get ruined, I only hope it's after Jonathan has been through Challenge A and can take over the task of drawing the world. For some other additions, I was able to find wooden cutouts at Michael's. I imagine I could have found a lot more if I had been looking throughout the year, but I never seemed to remember that. It worked out simply, anyway. When I made it in to look, I found sheep and birds (that I'll call doves) for $.09 each. Then Jonathan and I painted those white, drilled holes, drew in details, and sealed them with a clear spray gloss. Since I was crunched for time, I was glad that I purchased additional plain red and silver balls after Christmas last year. To keep with our theme, I simply used a gold paint marker to draw on various symbols for Christ or write on the names of Christ and portions of Scripture. I did find that the ones with the frosted surface seem like they will hold up better. The shiny silver ones we got seem to be easily scratched. There are some with crosses and shepherd staffs. A few of them have alphas and omegas. One has the words from Isaiah 9, "For unto you a child is born..." Another reads, "Son of God." 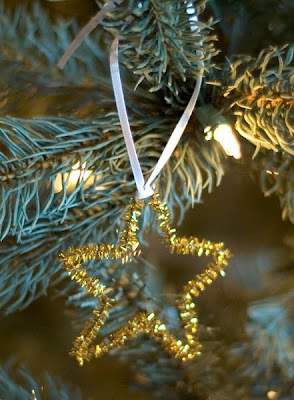 Some of my favorite ornaments are the most simple, like these stars made from glittery pipe cleaners. The point is that they don't have to be complicated or even perfect. Work with what you've got, and enjoy sharing the symbolism with your children. Crystal...you are so artistic... something I lack in the gene pool. 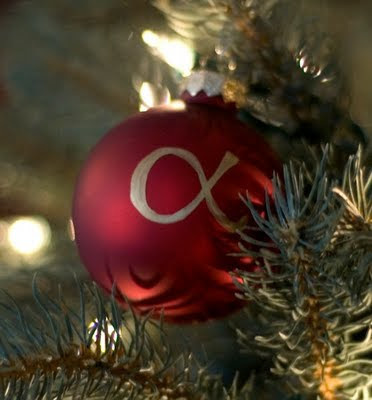 I am so wanting to start getting our tree all about the true meaning of Christmas. I know this will take a very long time to accomplish but I may use some of your ideas to start. 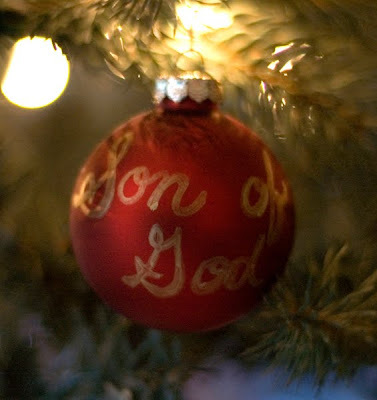 I love the idea of purchasing red ball ornaments and using a paint pen...I know that is something I can do. It may take a few Christmases to finally get the Christ tree. Thanks for sharing!